Welcome to our fourth post of Fathomless Females! For those of you who don't know, Fathomless Females is a 2015 feature where we showcase amazing female authors. Today, we have a lovely friend of mine joining us - Sky or StarlitSky99. Sky and I met on Twitter through our mutual love for the absolutely gorgeous Harry Lloyd (you're welcome). So before I start fangirling, let's get onto the interview! 1. How and when did you start writing? I started writing poems when I was around 13, but I didn't start writing stories until 4 years ago. I remember reading my favourite books Harry Potter and thinking, "you know what? I can do that too!" And thus my writing began, never thinking it'd see the light of day. 2. You post your writings mostly on Wattpad. What are the advantages and disadvantages? Do you have a favourite aspect? I found Wattpad by accident just wandering on the internet wanting to read other people's stuff. I love it there. Some advantages are easily putting your stories up for people to see, and meet amazing writers just like you who you can share and bounce ideas off of. Just being able to reach so many people is a blessing for any writer. Disadvantages are you can't always get feedback from the people who aren't signed up to Wattpad. Also your stuff is considered published by other certain sites so you can't resubmit to other places if you need to. 3. You write both stories and poetry. Do you find one easier than the other? Or is there one you prefer? I love writing poetry. It comes easy to me, I can write a poem on something I'm feeling in like 3 minutes, but I prefer to write stories more. I find it more fun to create worlds, characters, situations, and personalities. At the end of the day they're both my babies. 4. What’s a typical day of writing for you? When and where do you write? How often? Do you set a writing goal? I write when I get the itch, which is a lot. I couldn't live without writing. It's like breathing for me. I write my stories like it's a movie being played out in my head. That's how I see it, and I hope it comes across close enough for the readers to see it that way. I'll write anywhere it's quiet. I need quiet when I write so that I can gather my thoughts and make sense. But mostly I write lying on my bed - Nothing special just good old fashioned pen and paper. Then I type it and edit later. I tried the 30 day writing challenge and loved it. I only made it till day 26,but I feel that's still quite an achievement. I'll take it. I really loved keeping in touch with my writing and my audience of readers. It was nice. I'd like to get back to that place of writing again. I try to set writing goals, helps me to keep on track, but some days life just gets in the way. I'm working on it. 5. Give us a brief synopsis (or excerpt) of one of your stories. Loki held out his hand for me as I shakely find my way up the stairs, but once I was up there and looked around I suddenly didn't feel scared at all, but...empowered! Loki continued to talk and scare the masses. By this time the Television crews had appeared and he was plastered on every T.V. screen and heard on every radio station in the world. I knew it was wrong, yet as I watched him I couldn't help but be amazed, as I became drunk with his power. I was as mad for power as he was, and by the look in his eyes, he knew it now too. I only hoped Zach hadn't caught on. At least not yet. Before I knew what I was doing I stood on my tippy toes, grabbed his face in my hands and kissed him rough. I decided to declare my love and let the whole world know this...was my man, and for once I'm beginning to think I'm gonna like this. That was an excerpt from "Make It Right" on Wattpad Ch.20- The Takeover. And there you go! Thank you to Sky for joining us today. Make sure you go check out her Wattpad and we'll see you all next time. 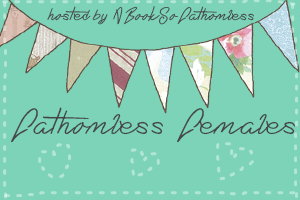 Next time on Fathomless Females: Alison Pensy, author of the Custodian series.